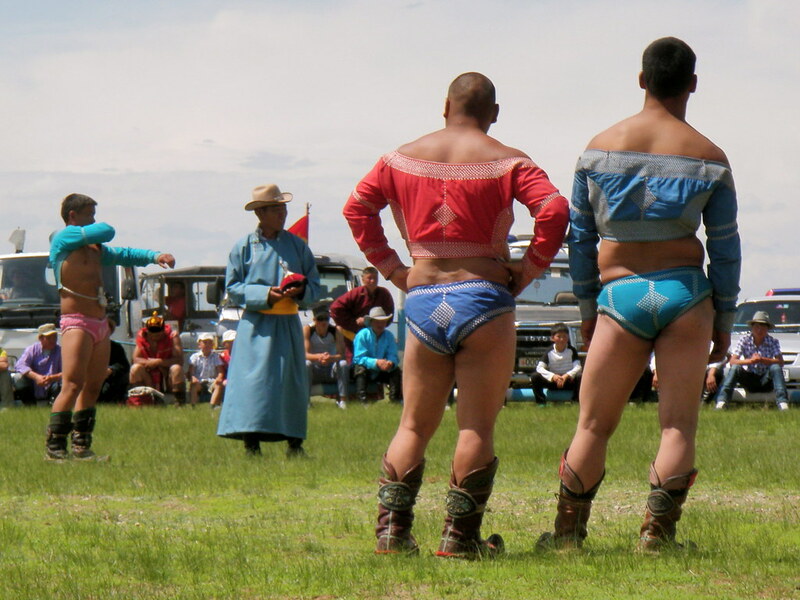 The Mongolian Riders return! 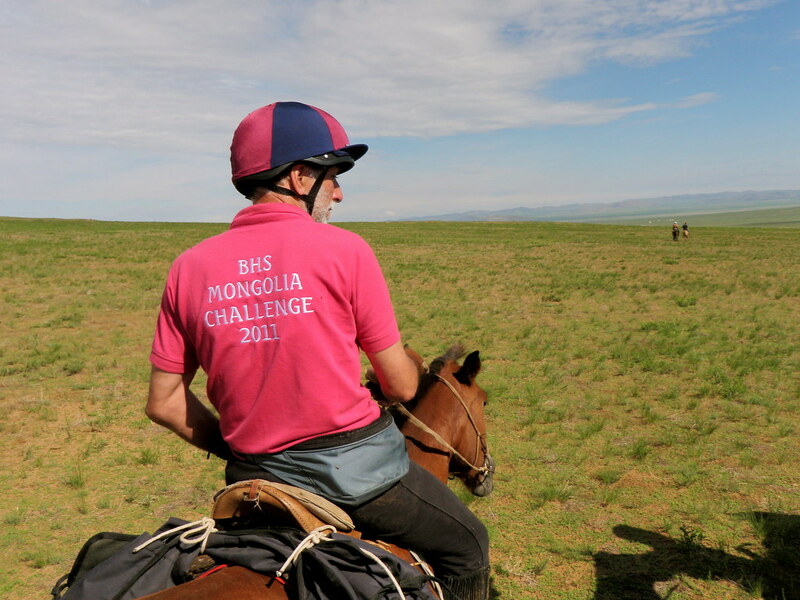 Welcome back to the following four riders who have returned from Mongolia after completing the BHS Challenge Ride for our Helping Horses campaign: Natasha Ansell, Philippa Kemp-Welch, Kelsey Thacker and Sabine Woods. Well done and thank you to the challenge riders and their sponsors who collectively raised £7,580 for the BHS. Philippa commented: "For me, the trip was the most inspiring and possibly the most terrifying of my life and I thoroughly recommend it, though not for the fainthearted. It was really a challenge!" Rolling grassland once covered a quarter of the Earth’s surface; today the Pampas, Prairie, Puszta in Hungary and grasslands of Ukraine have been developed for agricultural output; only the Mongolian Steppe has survived in pristine condition. 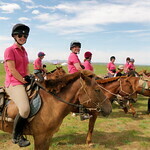 This ride is a visual experience as much as a riding experience: the altitude and unusually clean, clear air gives a powerful feeling of vastness and solitude as you ride across the treeless Steppe where the only trace of human activity is the nomads and their stock – pastoralists in harmony with their herds and habitat. 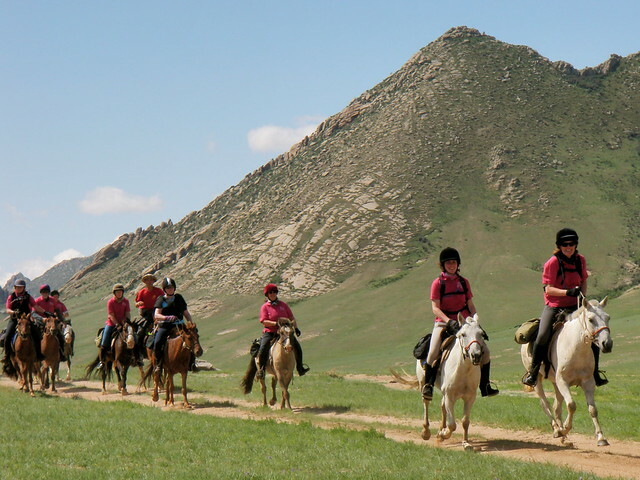 This trek gives challengers a life-changing experience and a rewarding way to raise much-needed funds for the welfare work of the British Horse Society. 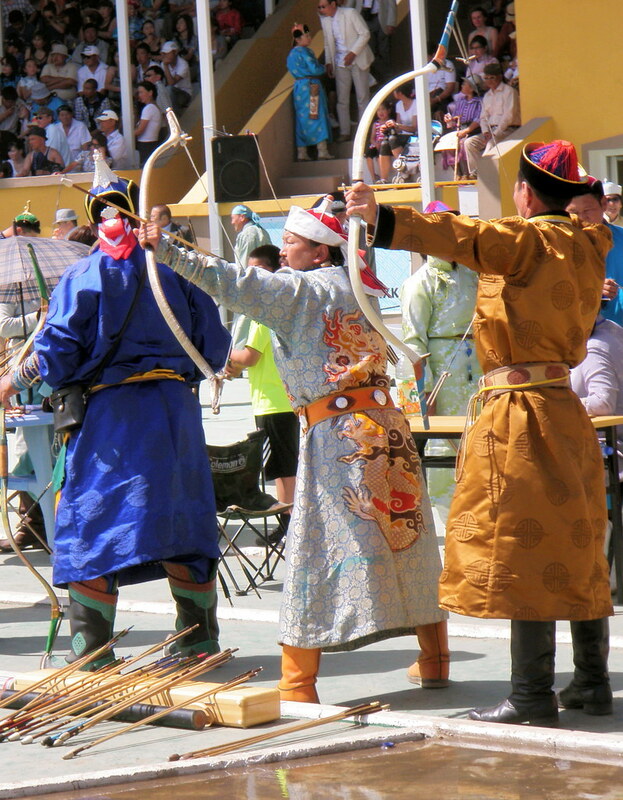 What is the Mongolian Horse Trek? This trek requires challengers to be confident and experienced as the ride can quickly change pace. 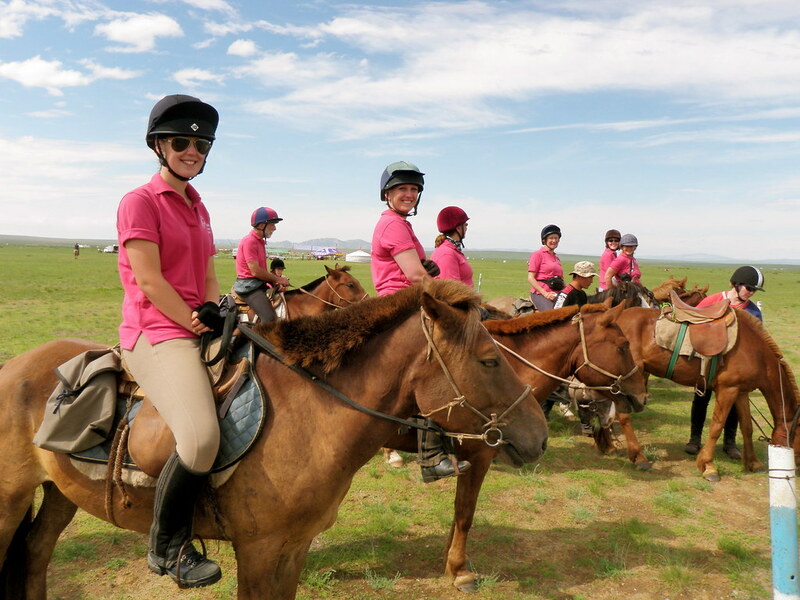 Rising southwest of Mongolia’s capital city Ulaanbaatar, you will spend up to seven and a half hours a day in the saddle and camp on the steppe. 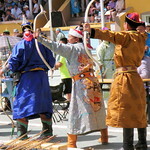 You will also spend two nights in a traditional gher camp. Which horses do I ride? You will be riding the small, locally bred Mongolian ponies that descend from the ancient Przewalski horse. Standing at 13hh to 14hh, some of these tough little creatures still bear the characteristic colouring and dorsal stripe of their ancient ancestors. What do I do on the challenge? The flight departs from London for Ulaanbaator. Indirect flight, change planes halfway and continue overnight to Ulaanbaator, Mongolia. After arriving in Ulaanbaatar and transferring to your hotel, you have a free afternoon to explore. In the evening you will dine at a local restaurant and receive a briefing on the trek. The bus will take us out of Ulaanbaatar and travel south, some 140km across the treeless Steppe to Holboo, which isn’t actually named on any map, but is a recognised spot. We will have arranged to rendezvous with a family of horse breeders and their gers. A 'ger' (Mongolian) is a synonym with 'yurt' (Turkish) and means 'tent', but it's rather more than the kind of tent we are used to in the UK: a ger is made from felt (beaten, compacted wool) and stands on a wooden structure creating a warm internal space large enough for a family to eat, relax and sleep in, with a wood-burning pot-bellied stove as centrepiece. We will select some good riding horses from among the hundreds available, saddle up, and have a trial ride. This is an opportunity to get the feel of your new horse and tack; if you’re not comfortable you can swap with one of the many horses available. Overnight in camp (not gers). You will require a sleeping bag and although mattresses are supplied, it’s as well to take along a Thermarest (or similar) to supplement your 'bed'. Today we ride out onto the Steppe. There is a good chance of seeing the wild sheep of the Gobi, the argali sheep (Ovis ammon) which favour the rocky outcrops of this area; it's also quite possible, if lucky, to see small herds of gazelle and perhaps even some wolves, but they are very timid and wary of people. 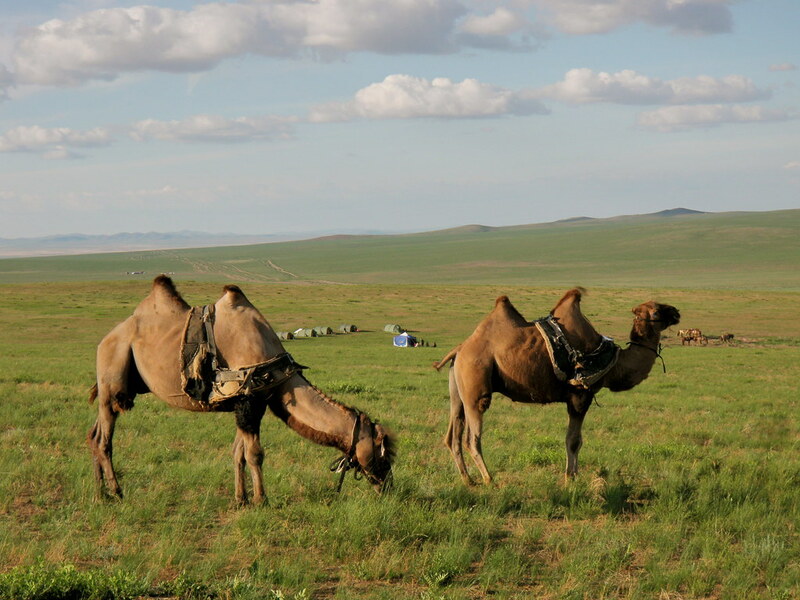 The team’s baggage will have been loaded onto traditional wooden camel carts, the same type as used by the locals, drawn by a Bactrian camel, and will await us at camp. 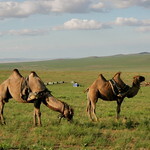 It will take a full day to ride across the grassland and reach the beginning of the sand at Manhan, which is a small sand dune that has cut its way through the Steppe, as if moving by itself, but it is actually pushed by strong prevailing winds from the West. We continue the ride to Elsen Hudag: 'hudag' means 'well' in Mongolian and there are usually many nomadic families in the immediate area. Our ride continues across the Steppe through an uninhabited area called Uushig where there is a small spring and some spectacular rock formations. You're even more likely to spot argali sheep here where they are less disturbed by people. Our campsite has some dramatic rock formations as a backdrop, which may become 'Flaming Cliffs' at sunset. Continue riding east, passing a small Gobi lake called Hariin Nuur, which has a surprisingly good population of water birds given that it is so far inland. There are other lakes in the area which have the combined effect of becoming 'islands' for waterfowl flying across a 'sea of grass'. The impressive Baga Zorgol Hairhan Mountains and rock formations are not far away to the west and provide scale and perspective to the surrounding Steppe. Pitch camp here and scan the ridges of this spectacular rock wall for Siberian ibex (Capra sibirica). Today we ride through a zone of transition from grassland towards sand-land! We gradually leave the populated grassland and cross a semi-arid habitat towards the Zorgol Hairhan giant rock formations. Zorgol is several hundred metres high and the central feature of the middle Steppe. We will spend two nights camping in this dramatic landscape and make a day trip into the foothills. 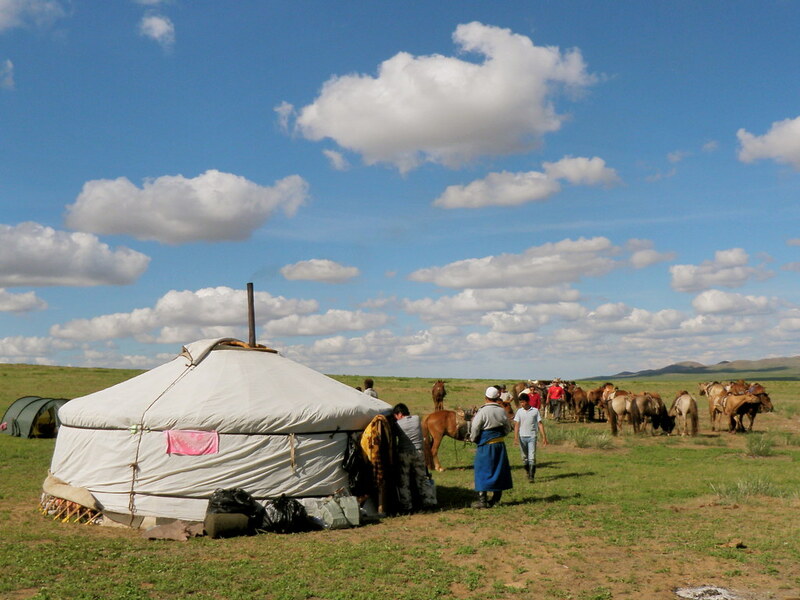 Today we ride past several nomadic families, each with herds of yaks, sheep, goats, horses and camels held in loose groups well-spaced away from their neighbours. The smaller animals (sheep and goats) are brought in to a compound, or coral, overnight because there is a danger that smaller animals may fall victim to wolves at night. The human occupants of this open and vast landscape are perhaps the most interesting of all the people we meet, because all the families in the area are traditional nomadic herdsmen. Our destination this evening is the Arburd Sands Ger Camp; not quite bricks-and-mortar, but a night in a ger is more comfy than the tents! The ride today is a short one and cuts through the Arburd Sands which is a massive sand dune 20 Km long. We ride right through this Sahara-like landscape which asks a lot of horses and riders. Overnight back at Arburd Sands Ger Camp. 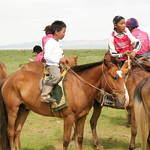 This morning we say goodbye to the horses, guides and wranglers and drive back to Ulaanbaatar. Check into the hotel. Free afternoon in the city. Transfer to the airport for the return flight to London via Moscow. Arrive in London during the afternoon. All our challenge rides require a registration fee. This £300 fee is needed to secure your place on the trip and is non-refundable, if, for any reason, you are unable to participate. Now you’ve read about the Mongolian Horse Trek we’re sure you’ll want to know how to raise the money to get there. We’ve put together a list of fundraising tips to help you on your way. This exciting challenge takes place in August 2018. If you think you’re ready to take it on, please complete an application form and send it, with your £300 registration fee, to Wendy Minor at wendy.minor@bhs.org.uk.